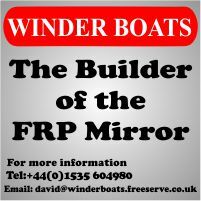 Traditionally Mirror dinghies had aft mainsheets with a 2:1 purchase as shown in the picture above. 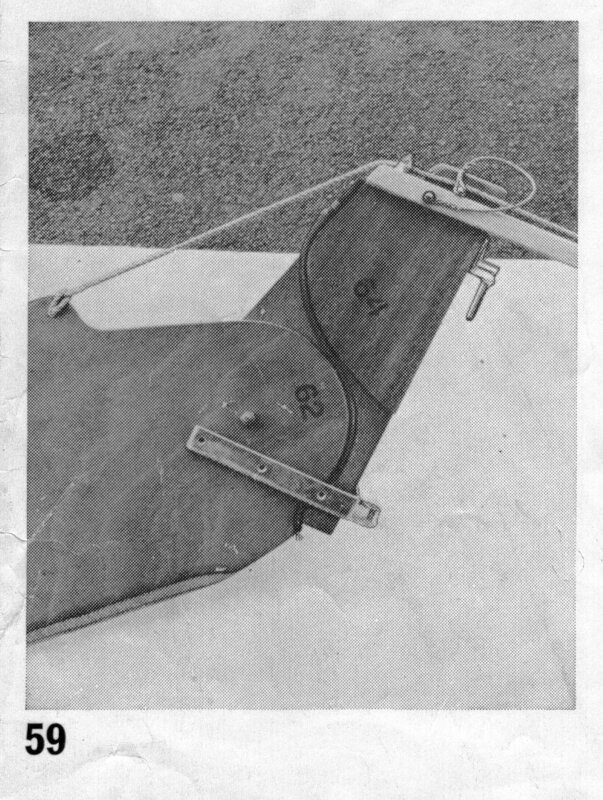 A dead-eye is screwed to the upper edge of the aft transom about 9" (225mm) to starboard of the centre line of the transom (Plate 58). 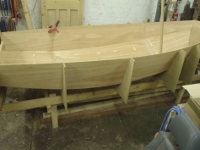 Lastly, a ½"hole is drilled through the transom 9" (252mm) to port of the centre line and 1½" from the top edge (Plate 59). These last two jobs are necessary because the main sheet eventually threads through hole and dead-eye. The reference to Plate 59 appears to be an error. This system of using two bullseye fairleads, rather than two blocks was pretty crude with a lot of friction, but helped keep costs down (remember early Mirrors were built down to a price). It's not suprising that purchasing mainsheet blocks was a common upgrade. GRP Mirrors, starting with the Bell-Ferranti, used a deck clip on the port side of the transom, instead of drilling a hole in the transom (i.e. through the hull and deck moulds). Some wooden boat builders also adopted this approach. 1.7.5 The distance between the centres of the mainsheet attachment points on the transom Minimum 450mm, Maximum 500mm. Some people think the cockpit is too small for a centre mainsheet and so prefer an aft mainsheet. 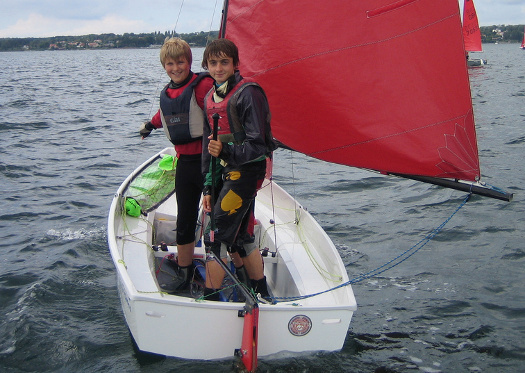 In the photo above, the boat has an improved aft mainsheet system. The lower mainsheet block mounted on a bridle, so it is centralized. This allows the mainsail to be centralized, without loading the leech, exactly the same as on a centre mainsheet arrangement. In this case the mainsheet starts on the becket of the lower mainsheet block. It is also permitted to have a split (or swallow tail) mainsheet, starting on the mainsheet attachement points on the transom, running up to the block on the boom and then back to the block on the bridle.